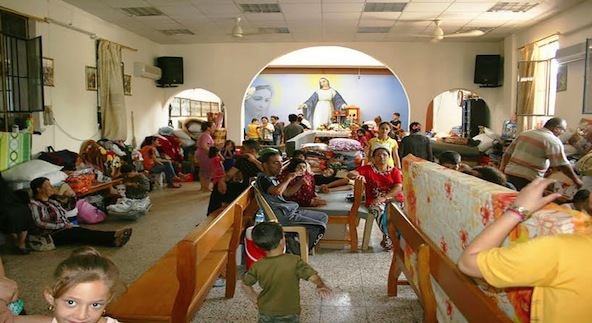 Christians taking refuge in a church, in Iraq. ‘Nowhere to lay their heads: Christians of Iraq face uncertain future”- click here for article. Petition for Persecuted Christians in Iraq is presented at United Nations: over 300,000 signatures: click here. Erbil, Iraq – On the eve of an ultimatum issued by Islamists to Christians in the Iraqi city of Mosul, the Chaldean bishop of Erbil, in nearby Kurdistan, urged prayers for the nation’s remaining followers of Christ. “We have hope that things will get better,” Archbishop Bashar Matti Warda of the Chaldean Archeparchy of Erbil said. The following was received indirectly by email from the Provincial leaders of the Mercy Sisters in Ireland and in Australia/Papua NewGuinea. It is a plea for urgent and continuous prayer for the Christians in Iraq who are facing death for being Christians. Please pray about it on receiving it, and forward it in any way you can. I received the following text message on my phone from Sean Malone who leads Crisis Relief International (CRI). We then spoke briefly on the phone and I assured him that we would share this urgent prayer need with all of our contacts. Send it to friends and Christians you may know. Send it to your prayer group. Send it to your pastor and phone him/her to pray on Sunday during the service – making a special time of prayer for this. We need to stand in the gap for our fellow Christians. Letter from the Redemptorist Superior General, Fr. Michael Brehl C.Ss.R., regarding the humanitarian crisis in Iraq, and the letter from the Redemptorist Archbishop, Bashar Warda, who made his Novitiate in Dundalk in Ireland in the late ’90′s. All of us are very aware of the serious humanitarian crisis in Iraq. Not only must we pray for peace, and support international efforts to negotiate an end to the violence and war, but we are very aware of the needs of thousands of families who have been forced from their homes. As our confrere, Archbishop Bashar Warda, C.Ss.R., recounts in his letter, many tens of thousands are now refugees relying on the assistance of the Christian community of the Archdiocese of Erbil. Again this week in his Angelus address, the Holy Father appeals to all people of good will not only to pray for peace, but also to offer concrete assistance to the suffering people of Iraq. Through Archbishop Bashar, we are offered the possibility of responding concretely to their needs. I encourage you to be as generous as you can in the face of this crisis so that the Archdiocese of Erbil and the whole Christian community can come to the aid of these refugee families. In their name, I thank you for your generosity. May the God of peace and justice hear the cry of his people and respond through the efforts to restore peace to Iraq. May Mary, the mother of the oppressed and refugees, accompany these families. May God bless the Christian community reaching out to care for them in their hour of crisis. As mentioned in the letter of Fr. General, Chaldean Archbishop of Erbil, Bashar M. Warda C.Ss.R., has made an appeal to the Confreres and friends of our Congregation for financial assistance to support the Christians who have sought refuge in his archdiocese. The letter of appeal is given below. Fr. Warda first arrived in Ireland in December 1995 and spent the following nine months learning English. In August 1996 he entered the Redemptorist novitiate in Dundalk and professed his vows as a Redemptorist on 24th August 1997. Following some higher studies he returned to Iraq. In May 2010 he was appointed bishop of Ebril, a diocese in northern Iraq. The letter of the Archbishop Bashar M. Warda C.Ss.R. As you might know from the news media, the city of Mosul in the North of Iraq, has been captured by fanatic militia, which persecuted the Christians, with the result that the Christian communities in Mosul, and the neighbouring villages have been dispersed. Most of them have sought a refuge in our diocese, and more than thousand families from the Mosul area are now here in Ankawa, asking refuge and shelter. We are welcoming our brothers and sisters as good as we can. Many of our families are doubling up with relatives who have fled the violence. Additional displaced souls are in camps. These past few days the Kurdish Directorate of Immigration has been using Archdiocesan facilities to register applications for residence with in the Kurdish provinces. Those communities still residing close to Mosul are expecting, within the coming weeks, additional threats to their safety as well. Shortages of water, food, and electricity aggravate the situation. Our struggle to meet the immediate needs of these most recent members of our refugee communities is going to be protracted. I am approaching you, my brothers in the congregation, with a request for generous cash donations which will help us ease the suffering. Your gifts will allow us to provide food, housing supplies, things needed to allow more basic hygiene. 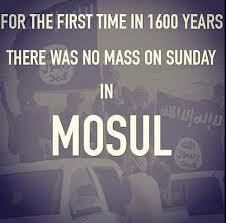 Many of us in the Archdiocese of Erbil arrived a few years ago. We have experienced what these most recently displaced families are going through now. As a Christian community we are suffering together, and we try to prepare for a long term. Whether those families emigrate or whether they remain in Iraq, our actual concern is their well-being, and we hope and pray for the stability and the Peace of Christ. Those of us who choose to remain in Iraq do so because we love our homeland and believe that there is a future for us. Stability is essential to our survival, as is education and employment. All of us are striving to do our part to achieve a lasting peace, and life in a just, pluralistic society. Your charity will play a key role in allowing us to start again. Thank you for hearing my personal appeal. ANY DONATIONS WILL BE FORWARDED VIA OUR REDEMPTORIST PROVINCIAL, FR. MICHAEL KELLEHER, at Liguori House, 75 Orwell Road, Dublin, or through your local Redemptorist Community. ← August 1st: Feast of St. Alphonsus de Liguori, Founder of the Redemptorists.